A deep low deepens over the north Atlantic and moves into the south Norwegian sea and over Norway and Sweden into the Baltic sea in the evening. Central mean sea level pressure in the low is expected to drop to ~960 mbar. It will produce a strong windstorm across parts of N Europe. A cutoff low over NW Africa affect extreme N Morocco, NW Algeria and parts of the W Mediterranean. 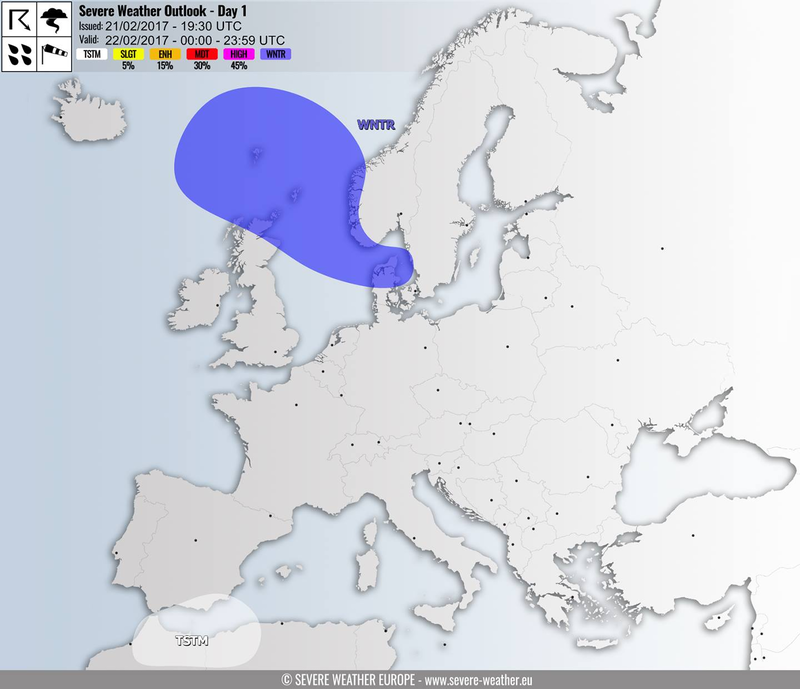 A WNTR risk has been issued for parts of the Altantic ocean between Iceland and Scotland, N and NE Scotland, southern Norwegian sea, northern North sea, extreme south of Norway and north Denmark for severe winds gusting at up to 100 km/h. Winds may gust at 130-150 km/h over open water and at higher elevations. A TSTM risk has been issued for parts of N Morocco, NW Algeria, the Alboran sea and extreme S Spain for scattered thunderstorms.